After taking power in the 1963 Syrian coup d'état, officially the 8th of March Revolution, a power struggle broke erupted between the Nasserites in the National Council for the Revolutionary Command and the Ba'ath Party. The Nasserites sought to reestablish the United Arab Republic, the former federation encompassing Egypt and Syria from 1958 to 1961, on Gamal Abdel Nasser's terms, the Ba'athists were skeptical of a new union with Nasser, and wanted a loose federation where the Ba'ath Party could rule Syria alone without interference. The Nasserites mobilised large street demonstrations in favour of a union. It took time before the Ba'ath Party knew how to respond to the issue, since the majority of Syrian Arab Nationalists were not adherents to Ba'athism, but of Nasserism and Nasser in general. Instead of trying to win the support of the populace, the Ba'athists moved to consolidate their control over the Syrian military. Several hundred Nasserites and conservatives were purged from the military, and Ba'athists were recruited to fill senior positions. Most of the newly recruited Ba'athist officers came from the countryside or from a low social class. These Ba'athist officers replaced the chiefly "urban Sunni upper-middle and middle class" officer corps, and replaced it with an officer corps with a rural background who more often the "kinsmen of the leading minority officer". These changes led to the decimation of Sunni control over the military establishment. The cost of clamping down on the protests was a loss of legitimacy, and the emergence of Amin al-Hafiz as the first Ba'athist military strongman. The traditional elite, consisting of the upper classes, who had been overthrown from political power by the Ba'athists, felt threatened by the Ba'ath Party's socialist policies. The Muslim Brotherhood in Syria was a historical rival of the Syrian Regional Branch, and it felt threatened by the party's secular nature. Akram al-Hawrani and his supporters and the Syrian Communist Party opposed the one-party system which the Ba'ath Party was establishing. The majority of Sunni Muslims were Arab nationalists, but not Ba'athist, making them feel alienated. The party was chiefly dominated by minority groups such as Alawites, Druzes, and Isma'ilis, and people from the countryside in general; this created an urban–rural conflict based predominantly on ethnic differences. With its coming to power, the Ba'ath Party was threatened by the predominantly anti-Ba'athist sentiment in urban politics—probably the only reason why the Ba'athists managed to stay in power was the rather weakly organised and fragmented opposition it faced. Cohesive internal unity had all but collapsed within after the 1963 seizure of power; Michel Aflaq, Salah al-Din al-Bitar, and their followers wanted to implement "classic" Ba'athism in the sense that they wanted to establish a loose union with Nasser's Egypt, implement a moderate form of socialism, and to have a one-party state which respected the rights of the individual, tolerating freedom of speech and freedom of thought. However, the Aflaqites (or Aflaqists) were quickly forced into the background, and at the 6th National Ba'ath Party Congress, the Military Committee and their supporters succeeding in creating a new form of Ba'athism – a Ba'athism strongly influenced by Marxism–Leninism. This new form of Ba'athism laid emphasis on "revolution in one country" rather than to unifying the Arab world. At the same time, the 6th National Congress implemented a resolution which stressed the implementation of a socialist revolution in Syria. Under this form of socialism, the economy as a whole would adhere to state planning and the commanding heights of the economy and foreign trade were to be nationalised. They believed these policies would end exploitation of labour, that capitalism would disappear, and in agriculture they envisioned a plan were land was given "to he who works it". However, private enterprise would still exist in retail trade, construction, tourism, and small industry in general. These changes and more would refashion the Ba'ath Party into a Leninist party. Before the crushing of the riots of 1964, a power struggle started within the Military Committee between Minister of Defence Muhammad Umran, and Salah Jadid. Umran, the committee's most senior member, wanted reconciliation with the rioters and an end to confrontation with the middle class, in contrast, Jadid believed the solution was to coerce and repress the protesters so as to save the 8th of March Revolution. This was the first open schism within the Military Committee, and would prove decisive in coming events. With Hafez al-Assad's support, the Military Committee initiated a violent counter-attack on the rioters This decision led to Umran's downfall. He responded by revealing the Military Committee's plan of taking over the Ba'ath Party to the party's National Command. Aflaq, the Secretary General of the National Command, responded to the information by ordering the dissolution of the Syrian Regional Command. He was forced to withdraw his request because the party's rank-and-file rose in protest. When an old guard Ba'athist tauntingly asked Aflaq "how big a role his party still played in government", Aflaq replied "About one-thousandth of one percent". Umran's revelations to the National Command led to his exile, and with the National Command impotent, the Military Committee, through its control of the Syrian Regional Command, initiated an attack on the bourgeoisie and initiated a nationalisation drive which extended state ownership to electricity generation, oil distribution, cotton ginning, and to an estimated 70 percent of foreign trade. After Umran's downfall, the National Command and the Military Committee continued their respective struggle for control of the Ba'ath Party. While the National Command invoked party rules and regulations against the Military Committee, it was clear from the beginning that the initiative lay with the Military Committee. The reason for the Military Committee's success was its alliance with the Regionalists, a group of branches which had not adhered to Aflaq's 1958 orders to dissolve the Syrian Regional Branch. The Regionalists disliked Aflaq and opposed his leadership. Assad called the Regionalists the "true cells of the party". The power contest between the allied Military Committee and the Regionalists against the National Command was fought out within the party structure. However, the Military Committee and the Regionalists managed to turn the party structure on its head. At the 2nd Regional Congress (held in March 1965), it was decided to endorse the principle that the Regional Secretary of the Regional Command would be the ex officio head of state, and the Regional Command acquired the power to appoint the prime minister, the cabinet, the chief of staff, and the top military commanders. This change curtailed the powers of the National Command, who thenceforth had very little say in Syrian internal affairs. In response, at the 8th National Congress (April 1965) Aflaq had originally planned to launch an attack on the Military Committee and the Regionalists, but was persuaded not to by fellow National Command members – most notably by a Lebanese member, Jibran Majdalani, and a Saudi member, Ali Ghannam – because it could lead to the removal of the party's civilian leadership, as had occurred in the Iraqi Regional Branch. Because of this decision, Aflaq was voted from office as Secretary General, to be succeeded by fellow National Command member Munif al-Razzaz. Razzaz was a Syrian-born Jordanian who was not rooted enough in party politics to solve the crisis, even if under his command several joint meetings of the National and Regional Commands took place. Not longer after Aflaq's loss of office, Hafiz, the Secretary of the Regional Command, changed his allegiance to support the National Command. While Hafiz was the de jure leader of Syria (he held the offices of Regional Command secretary, Chairman of the Presidential Council, prime minister and commander-in-chief), it was Jadid, the Assistant Secretary General of the Regional Command, who was the de facto leader of Syria. Arrangements devised in 1963 between 'Aflaq and the Military Committee led to a very close mutual involvement of the military and civilian sectors of the regime, so that by the end of 1965 the politics of the Syrian army had become almost identical to the politics of the Ba'th Party. The principal military protagonist of the period Hafiz, J'did, and 'Umran were no longer on military service and their power depended on their intermediary supporters in the army and in the party. In November 1965, the National Command issued a resolution which stated it was forbidden for the Regional Command to transfer or dismiss military officers without the consent of the National Command. After hearing of the resolution, Jadid rebelled immediately, and ordered Colonel Mustafa Tlas to arrest the commanders of the Homs garrison and his deputy, both supporters of National Command. In response, Razzaz called for an emergency session of the National Command which decreed the Regional Command dissolved, and made Bitar Prime Minister. Hafiz was made Chairman of a new Presidential Council and Shibli al-Aysami his deputy. Umran was recalled from exile and reappointed to the office of Minister of Defence and commander-in-chief, and Mansur al-Atrash was appointed Chairman of a new and expanded National Revolutionary Council. Jadid and his supporters responded by making war on the National Command. Assad, who neither liked nor had sympathy for the Aflaqites, did not support a showdown through the use of force. In response to the coming coup, Assad, along with Naji Jamil, Husayn Mulhim and Yusuf Sayigh, left for London. The coup began on 21 February 1966 when Umran tested his authority as Minister of Defence by ordering the transfer of three key Jadid supporters; Major-General Ahmad Suwaydani, Colonel Izzad Jadid and Major Salim Hatum. The Military Committee would respond the next day, but before that it staged a ruse which threw the National Command off balance. The ruse was that Abd al-Ghani Ibrahim, the Alawi commander of the front facing Israel, reported to headquarters that a quarrel had broken out among front-line officers, and that guns had been used. Umran, al-Hafiz and the Chief of Staff left for the Golan Heights in a hurry for a lengthy discussion with the officer corps there; when they returned at 3 am on 23 February they were exhausted. Two hours later, at 5 am, Jadid launched his coup. Not long after, the attack on al-Hafiz's private residence began, led by Salim Hatum and Rifaat al-Assad, and supported by a squadron of tank units led by Izzad Jadid. Despite a spirited defence, Hafiz's forces surrendered after all their ammunition was spent – Hafiz's daughter lost an eye in the attacks. The commander of al-Hafiz's bodyguard, Mahmud Musa, was nearly killed by Izzad Jadid, but was saved and smuggled out of Syria by Hatum. There was resistance outside Damascus. In Hama, Tlass was forced to send forces from Homs to quell the uprising, while in Aleppo Aflaq loyalists briefly controlled the radio station and some resistance was reported in Latakia and Deir ez-Zor. After their military defeats, resistance all but collapsed – Razzaz was the only National Command member to put up any organised resistance after the military defeats, issuing statements against the government from his different hiding places. Jadid appointed Nureddin al-Atassi as President, Regional Secretary of the Regional Command and Secretary General of the National Command, Yusuf Zu'ayyin became Prime Minister again, and Brahim Makhous was appointed Minister of Foreign Affairs. Other personalities were former Head of Military Intelligence Ahmad al-Suwaydani, who was appointed Chief of Staff, Colonel Muhammad Rabah al-Tawil was appointed Minister of Labour and Head of the newly established Popular Resistance Forces, and Colonel Abd al-Karim al-Jundi, a founding member of the Military Committee, was appointed Minister of Agrarian Reform and later, Minister of Interior. When the National Command was toppled in 1966, the Iraqi Regional Branch remained, at least verbally, supportive of the "legitimate leadership" of Aflaq. When the Iraqi Regional Branch regained power in 1968 in the 17 July Revolution no attempts were made at a merger, to achieve their supposed goal of Arab unity, or reconciliation with the Syrian Ba'ath. After the establishment of Ba'ath rule in Iraq, many members of the Syrian-dominated Ba'ath movement defected to its Iraqi-counterpart, few if any Iraqi-loyal Ba'athists attempted to change its allegiance to Damascus. The reason for this was that those defecting from Damascus were loyal to the old, Aflaqite National Command. Several older members such as Bitar, Hafiz, Shibli al-Aysami and Elias Farah, either visited Iraq or sent a congratulatory message to Ahmed Hassan al-Bakr, the Regional Secretary of the Iraqi Regional Command. 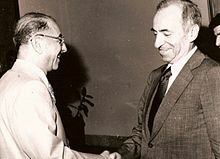 Aflaq did not visit Iraq until 1969, but from late 1970, he would become a leading Iraqi Ba'ath official, although he never acquired any decision-making power. From the beginning the Damascus government began an overwhelmingly anti-Iraqi Ba'athist propaganda campaign, to which their counterparts in Baghdad responded. However, the Iraqi Ba'athists helped Assad, who at the 4th Regional Congress of the Syrian Regional Branch called for the reunification of the Ba'ath Party, in his attempt to seize power from Jadid. It was reported that Assad promised the Iraqis to recognize Aflaq's historical leadership. Iraq's foreign minister Abd al-Karim al-Shaykli even had his own personal office in the Syrian Ministry of Defence, which Assad headed. However, this should not be misconstrued, the Iraqi Regional Branch was Arab nationalist in name only, and was in fact Iraqi nationalist. The Syrian Regional Branch began denouncing Aflaq as a "thief". They claimed that he had stolen the Ba'athist ideology from Zaki al-Arsuzi and proclaimed it as his own, with Assad hailing Arsuzi as the principal founder of Ba'athist thought. The Iraqi Regional Branch, however, still proclaimed Aflaq as the founder of Ba'athism. Assad has referred to Arsuzi as the "greatest Syrian of his day" and claimed him to be the "first to conceive of the Ba'ath as a political movement." Aflaq was condemned to death in absentia in 1971 by Assad's government. The Syrian Regional Branch erected a statue in Arsuzi's honour not long after the 1966 coup. Nevertheless, the majority of Ba'ath followers outside Syria still view Aflaq, not Arsuzi, as the principal founder of Ba'athism. When the Iraqi Regional Branch seized power, the Syrian Regional Branch responded by not mentioning in the press release that a Ba'ath organisation had taken power in Iraq. For instance, it mentioned that Bakr had been appointed president, but did not mention his party's affiliation, and instead referred to the incident as a military coup. While the Syrian Ba'ath denied giving any legitimacy to Iraqi Ba'ath, the Iraqi Ba'ath were more conciliatory. For instance, Bakr stated "They are Ba'athists, we are Ba'athists" shortly after the Iraqi Regional Branch seized power. Foreign Minister Shaykli stated shortly after that "there is nothing preventing co-operation between us [meaning Iraq and Syria]". The anti-Iraq propaganda reached new heights within Syria at the same time that Assad was strengthening his position within the party and state. When Jadid was toppled by Assad during the Corrective Movement in 1970, it did not signal a change in attitudes, and the first joint communique of the Syrian-dominated National Command and the Syrian Regional Command referred to the Iraqi Ba'ath as a "rightist clique". ^ a b c Rabinovich 1972. ^ Kienle 1991, p. 42.